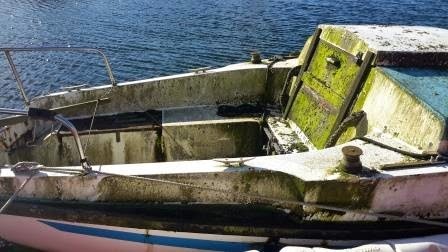 Ardfern Yacht Centre: What needs fixed? You negotiated traffic jams and diversions, sat behind caravans and tour buses on your journey here, but finally made it to Ardfern safe and sound. You unloaded more equipment, food and drink than you thought could fit in your car. You made numerous trips back and forth between the car and the boat using the trolley with the wobbly/squeaky wheel or in the dinghy that seems to have shrunk and become less manoeuvrable than before, but did finally manage to get everything, including friends/family/pets, safely stowed on board. You cast off and set sail in good/bad/indifferent weather and, managing to avoid rocks and any other objects that might cause some damage to your boat (including unwanted visitors), you had a lovely time sailing or motoring around the west coast of Scotland. However, whilst under way, you remembered all the bits on the boat that weren't working last season and that you forgot to get fixed. You also identified an alarming number of new breakages and pieces of equipment that aren't quite working as they did or should. You then read all the boating magazines and got fully up to speed with all the latest equipment and gadgets and electronics that you don't have but think you absolutely must have, or should have, or would like, or intend to get anyway because it's your boat, your money and you deserve it. In addition to that, you saw that rather annoying skipper from the boat a couple of berths along from you that you would like to be able to casually drop into a conversation next year the line "yes, ours is the latest model, much more compact and powerful, I think you'll find the version you have is now obsolete...."
Now, before you finish up for the season, and unpack all your gear again, and shove it all in the car for the journey back home, why not bookmark this post or make a note that, before you forget everything that needs done, you really should fill out the Winter Maintenance Form for 2014/15 and send it to the workshop at Ardfern Yacht Centre. Select here to go to Winter Maintenance Form 2014/15 now and tell us what you need fixed.